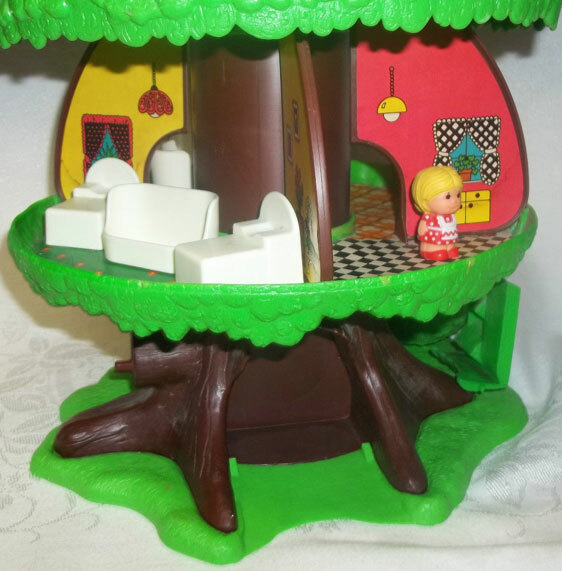 Description: This adorable fully furnished tree house features a family of Tree Tots ("Your friends from the magic forest"). 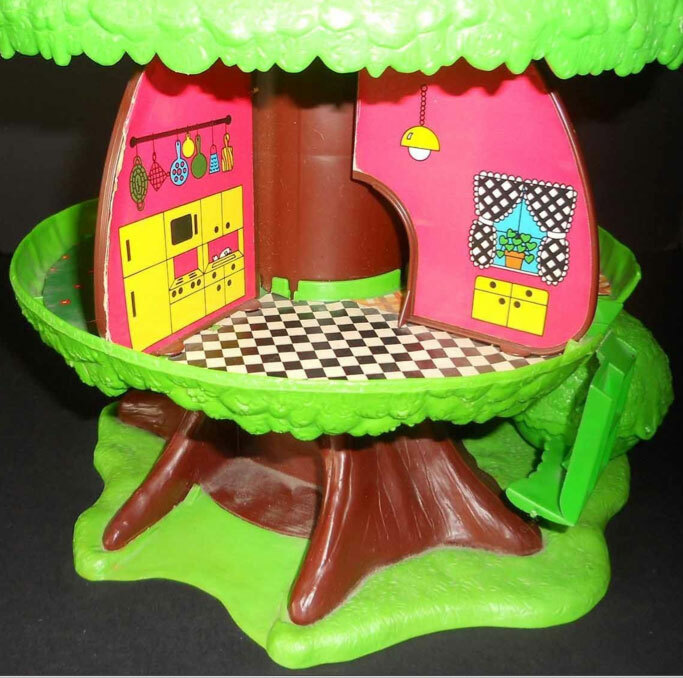 The "tree" has a leaf "dome" top that lifts up to reveal the home's interior. The interior has realistically decorated walls and floors, and the set includes 9 pieces of furniture. 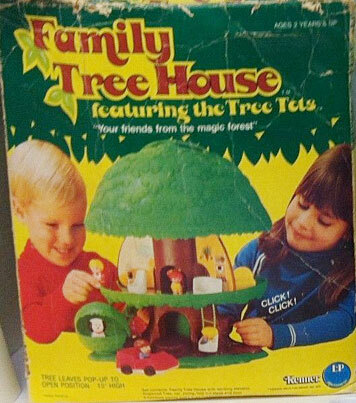 The family of Tree Tot figures can enter the house via the fold-out side steps or the hand-operated elevator. 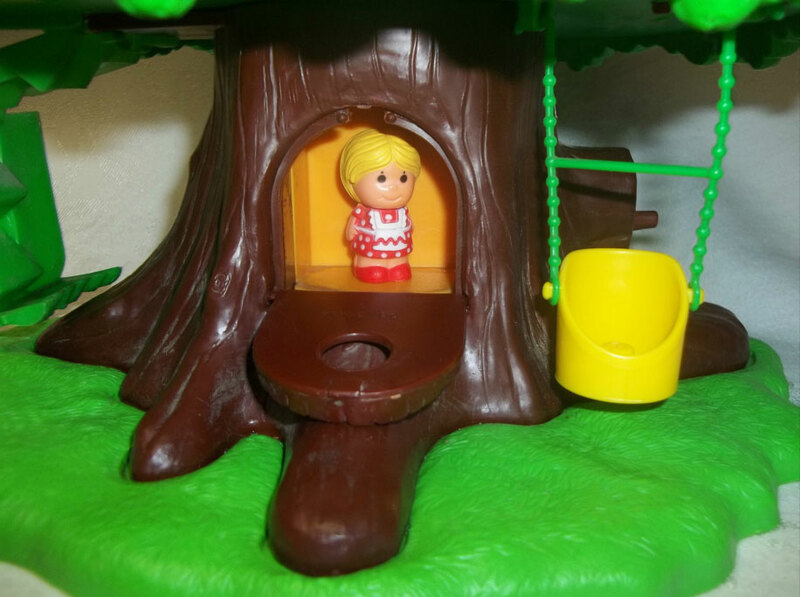 The set also includes a tree swing, a 4-man car, and a dog house. 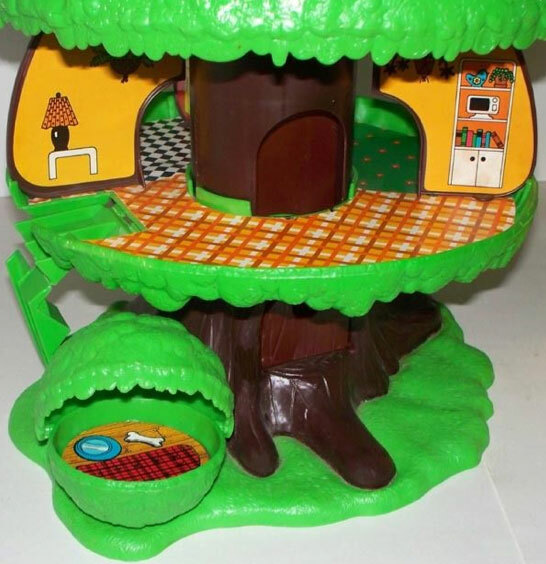 The Family Tree House is the most popular and longest running of all the Kenner Tree Tot sets. 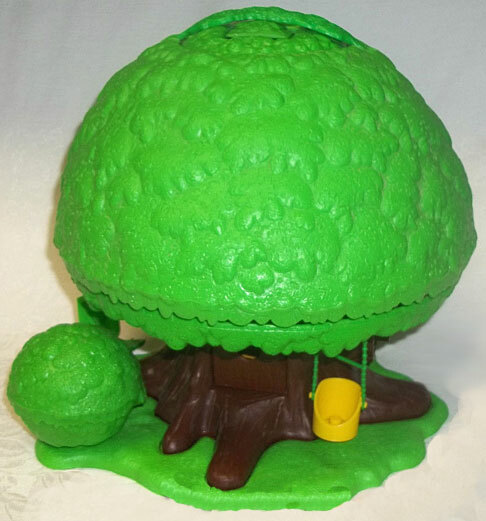 The tree design was slightly altered and used for the 1977 Firehouse Set, then altered again for the Star Wars Return of the Jedi Ewok Family Hut. 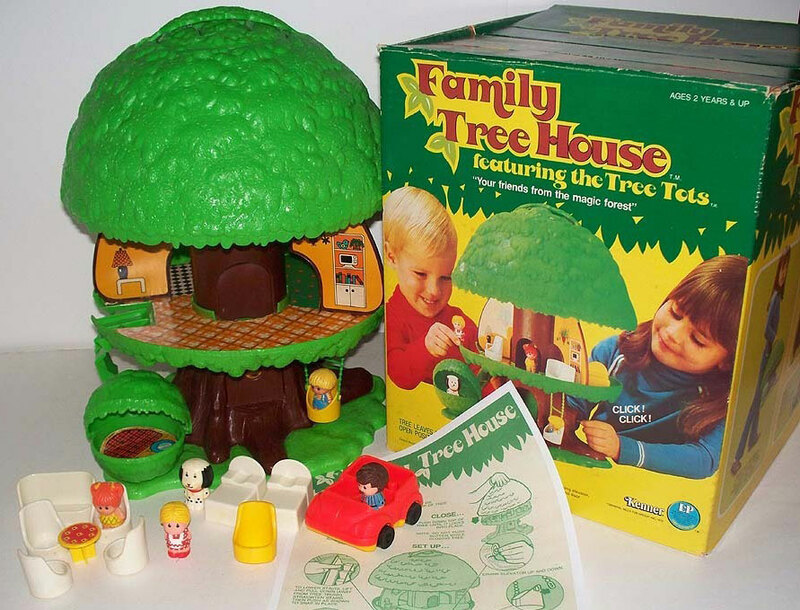 The Family Tree House set was also sold in Europe using slightly different lithographs on the walls/floors. KTT40 - Arched Door - Small brown door with a hole in the center and an arched top. Door has hinges on the bottom edge to attach as a fold-down door. KTT2 - Round yellow single-seat chair with a high backrest. The center of the seat has a raised knob (to help keep figure in place), and each side of the chair has a small rounded knob to attach swing ropes. KTT3 - Green flexable swing ropes (2 "ropes" with center connector bar). 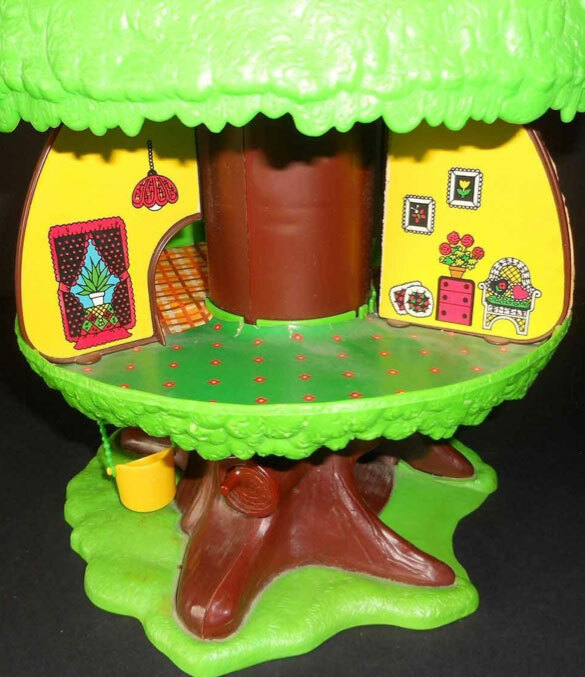 One end of each rope has a hook to attach to the tree house base and other end has a loop to attach to the swing chair. KTT4 - Round green doghouse that is hinged to allow the top half to roll back and allow access to the interior. The bottom inside has a large raised peg. KTT5 - Round brown flat disc with a lithograph on one side featuring a red/black plaid (rounded) dog bed, blue water dish, and a bone. 1 each - KTT8 - Rocking Chair - Round yellow single-seat chair with a high backrest. Bottom of the base is slightly curved, allowing the chair to rock. 1 each - KTT10 - Coffee Table - Small round yellow table with plus-shaped (+) legs. Top of table has a round red lithograph featuring white flowers with black dot center. KTT11 - Family Car - Yellow top, red base 4-seat car with small black wheels. KTT12 - Dad - Treemont Tree Tot - Man with brown hair, brown moustache, blue pants, blue/red shirt, red tie, black shoes, and black belt. KTT13 - Mom - Willow Tree Tot - Woman with yellow hair in bun wearing a red polka-dot dress with white apron and red shoes. KTT14 - Boy - Chip Tree Tot - Boy with yellow hair wearing blue overall shorts and a yellow/red stripe shirt. 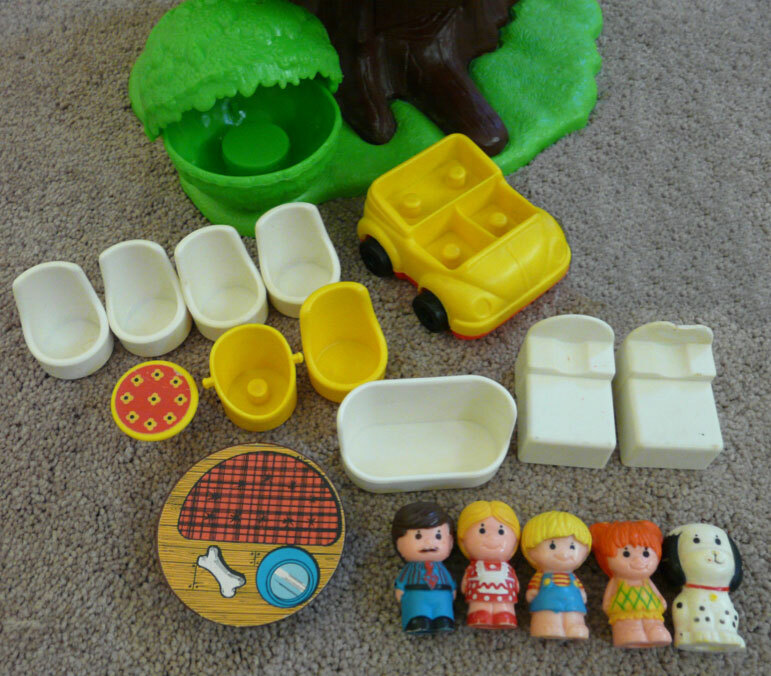 KTT15 - Girl - Honey Tree Tot - Girl with orange hair in pigtails wearing a yellow romper with green lines. KTT16 - Dog - Barky Tree Tot - White dog with black ears, black spots, and a red collar. KTT17 - Red top, yellow base 4-seat car with small black wheels.